With roughly 25 years of experience turning wrenches, NASCAR Winston Cup Crew Chief Kevin Hamlin has had his share of experience in the mechanical area. And when Richard Childress moved Kevin Hamlin into the spotlight as Dale Earnhardt's crew chief, replacing Larry McReynolds, Kevin was about to get a whole different kind of experience; the experience of working with a seven-time Winston Cup champion. Kevin Hamlin began getting experience with cars at an early age. In 1974, while still in high school, Hamlin began turning wrenches with Butch Miller. He began his racing career as a drag racer in his home state of Michigan. In 1989 Hamlin left Michigan behind, moving to North Carolina to work with Travis Carter's NASCAR Winston Cup Series team. In 1994 Kevin Hamlin left Travis Carter for Richard Jackson's Precision Products team. While with Jackson's team, Hamlin guided driver Rick Mast to the inaugural pole at the Brickyard 400 at Indianapolis Motor Speedway. In his 93 starts with Mast, the team posted five top-5s and 19 top-10s. Kevin Hamlin began his career with Richard Childress Racing in 1997 when he joined the newly formed No. 31 Lowe's Chevrolet team with rookie driver Mike Skinner. As teammates to the No. 3 Goodwrench Chevrolet driven by Earnhardt, expectations for the new No. 31 team were high. Hamlin and the No. 31 bunch met those expectations in their first race, winning the 1997 Daytona 500 pole. Meanwhile, at the GM Goodwrench Service team, Larry McReynolds had just stepped on board as crew chief to Dale Earnhardt. Expectations were high for an 8th title for Earnhardt in 1997 with the well experienced McReynolds calling the shots. 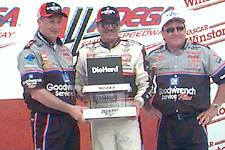 Kevin Hamlin (left), Dale Earnhardt, and Richard Childress celebrate their victory in the 1999 DieHard 500 at Talladega. One and a half years later, midway through the 1998 season, both crew chiefs had reached recognizable achievements with their drivers. However, RCR was not competitively on the same level as many of the other super-teams such as Hendrick Motorsports and Roush Racing. In a somewhat desperate move, Richard Childress decided to switch his two crew chiefs, moving McReynolds to the No. 31 team driver by Skinner, and moving Hamlin to the No. 3 team driven by Earnhardt. Although Hamlin admits he was nervous at first, he has gotten more comfortable working with Earnhardt, figuring "what can go wrong when you're working with a seven-time champion." Race by race the combination of Hamlin and Earnhardt is getting stronger. The duo got their first win together in the 1999 DieHard 500, and more victories look to be just around the corner. When Hamlin is not at the race track or shop working on the No. 3 Chevrolet, he enjoys spending time outdoors, as Earnhardt does. He can often be found horseback riding and riding his dirt bike.